Employees are cautiously testing the water when it comes to their salaries and hiring managers are ready to cough up the cash. While four in 10 (40 percent) hiring managers have seen an increase in employees asking for raises, half (50 percent) have seen no change. Employees at smaller companies are more likely than employees at larger companies to ask for an increase in their salaries. Over one-third (37 percent) of finance hiring managers from smaller companies say the number of employees asking for an increase in salary has risen, compared to only 25 percent of those at mid-sized companies. 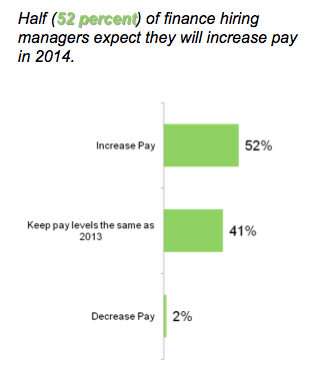 Half (52 percent) of finance hiring managers expect they will increase pay in 2014. Hiring managers are most willing to negotiate salaries, but what really keeps employees happy are career development opportunities. When it comes to hiring negotiations, salary is most likely to be up for discussion. Finance hiring managers are much more willing to negotiate salary (39 percent) over employee development (14 percent), vacation time (11 percent), flex-time (11 percent), device benefits (7 percent) or title (4 percent). Interestingly, finance hiring managers at small companies are twice as likely to negotiate salary as those at mid-sized companies (45 percent versus 22 percent) when recruiting finance and accounting professionals. Conversely, finance hiring managers at mid-sized companies are more willing to kick-in the perks; one in five (20 percent) are willing to negotiate employee development options (versus 12 percent at small companies) and about one in 10 (12 percent) will negotiate device benefits (versus 1 percent at small companies). Yet despite knowing that their employees are leaving for lack of career development opportunities, hiring managers are not particularly concerned about it. A small minority of hiring managers say employee development and upward mobility keep them up at night (14 percent and 10 percent, respectively). Instead the top concerns keeping finance hiring managers awake at night are split between recruitment (25 percent) and team effectiveness (24 percent). 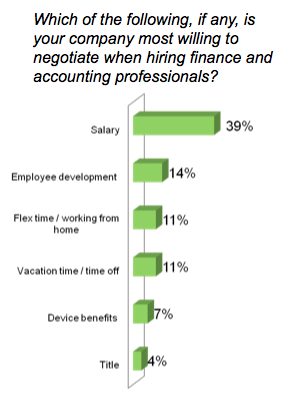 Retaining talent is becoming increasingly challenging for finance and accounting departments. Approximately four in 10 (39 percent) finance hiring managers say their company has had a harder time retaining talent than it did three years ago. On top of their need to retain talent, some companies are taking on more talent as well. Approximately one in five (19 percent) hiring managers say their company will likely increase hiring finance and accounting professionals in 2014. Mid-level talent is a struggle for hiring managers, while executive professionals are a dime a dozen. Many finance hiring managers (38 percent) feel that mid-level roles in finance and accounting are by far the most challenging to fill. Conversely only 8 percent of hiring managers say executive roles are difficult to hire. Company size may also determine which roles are most challenging to place; a third (33 percent) of finance hiring managers from small-sized companies say entry level finance and accounting positions are hardest to place, compared with just 20 percent of those from mid-sized companies. Financial hiring managers say diversity programs have yet to take hold, especially at private companies. Only four in 10 (44 percent) hiring managers say they have a diversity program in place at their company compared to the majority – 56 percent – that do not. Of those that do have a program in place, only one in five (22 percent) hiring managers say that they are regularly measured against their diversity program, and the same amount say they have a program in place but it’s only a formality and not enforced (22 percent). Hiring managers who work at private companies are especially likely to say they lack a diversity program. Just 41 percent of hiring managers at private companies say they have diversity programs in place. Whether you are looking to hire top talent, or searching for your next great accounting or finance position, these results provide greater insight into Talent Management in our industry. For more information on recruiting and retaining top talent, contact your local Accounting Principals office today.